In small companies, asset management is not such a big deal. You can track the company's physical (non-disposable) assets in a simple spreadsheet. You can see what computers, monitors, phones, printers, and software the company has available, and see who they are assigned to. Problems appear when larger companies try to use the same method for tracking their assets. Errors creep into the spreadsheets, assets are 'lost,' too many of one particular asset is bought by mistake, and the unnecessary costs start to grow out of control. In fact, Gartner, the expert advisory company, found that when their clients implemented an IT asset management system — and not just a spreadsheet — they saved 30% of their costs in the first year alone, and at least 5% in subsequent years. When you can see the trouble spots — where assets are lost or regularly require service — it is a simple matter to redesign processes or choose different products to save on these costs. Many dedicated asset management solutions can cost upwards of $50,000. But it doesn't have to be so expensive. Atlassian in Australia set themselves a challenge — to implement an asset management system under $5,000. By reusing the software tools they already use, and purchasing only items to support equipment tagging - QR code creation, scanning and printing - Atlassian developed an efficient and robust asset tracking lifecycle for all their IT hardware, well within their budget. If you are a tech company, chances are you are already using JIRA for software development and/or JIRA Service Desk for customer service requests. Everyone in your company is already using JIRA, so it makes sense to include the physical tools they use into the same system and workflows. Of course, you do need to have experience with JIRA to roll-your-own more complex asset management system using JIRA Service Desk. But for small companies, or those who want a simple tracking system, this is an affordable and doable option. 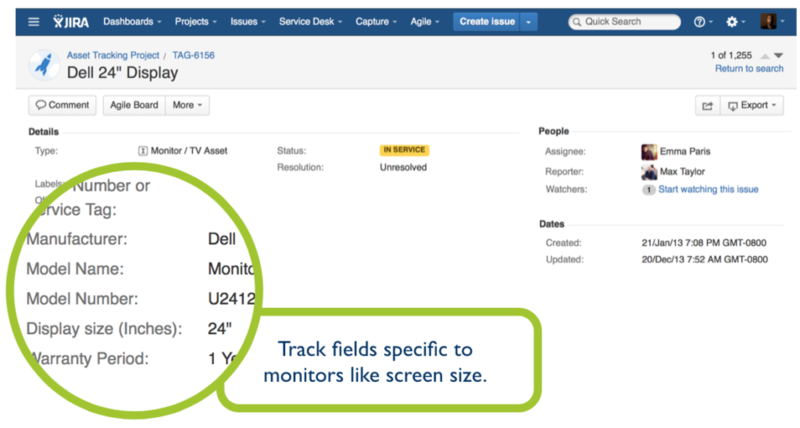 There are a few things you need to do to set up an asset management system using JIRA Service Desk. Create a new project in JIRA Service Desk, to store all of your equipment. For example: You can use a Simple Issue Tracking project, and call it TAG (every asset will have a unique TAG number). Define your asset types: computers, monitors, printers, cellphones and software. Use a different Issue Type for each asset type. 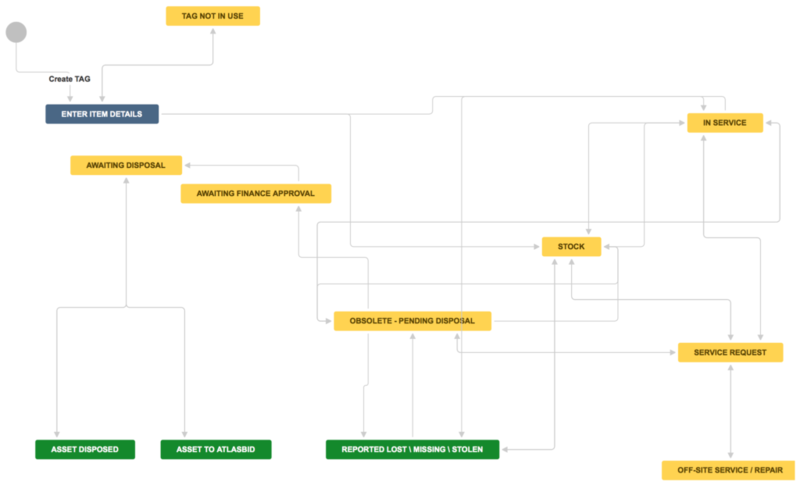 Don't forget to assign your asset types to an Issue Type Scheme for asset tracking. Record the details of each asset type: Add custom fields (release year, make, model, hardware specifications, etc. ), and add these fields to the screens associated with each issue type. JIRA has three stages you can use in a workflow, that can be modified for asset management: New, in progress, and done. New - asset details are entered, the asset is given a TAG number, and is transitioned into the pool of available assets. In Progress - An asset is assigned to a person from the pool of available assets (the asset is now in use). In Progress - If a problem occurs, the person raises a service request for that asset (the asset is now awaiting service). This can be easily automatically linked to a service request ticket within JIRA Service Desk. Done - At the end of an asset's life, it is disposed of. Done - If an asset is lost or stolen, it is reported. Atlassian developed a more complicated process, as you can see below, and has published a great tutorial for an asset management workflow. Each asset needs to have a unique ID. Labelling each piece of equipment is easy if you have a sticker printer that can print barcodes or QR codes. And changing the assignment of each asset — stating who has what equipment — is easy if you have a scanner to quickly change the details for that specific asset in the system. There is no point in having an asset management system if you do not generate reports to see where you can save money. 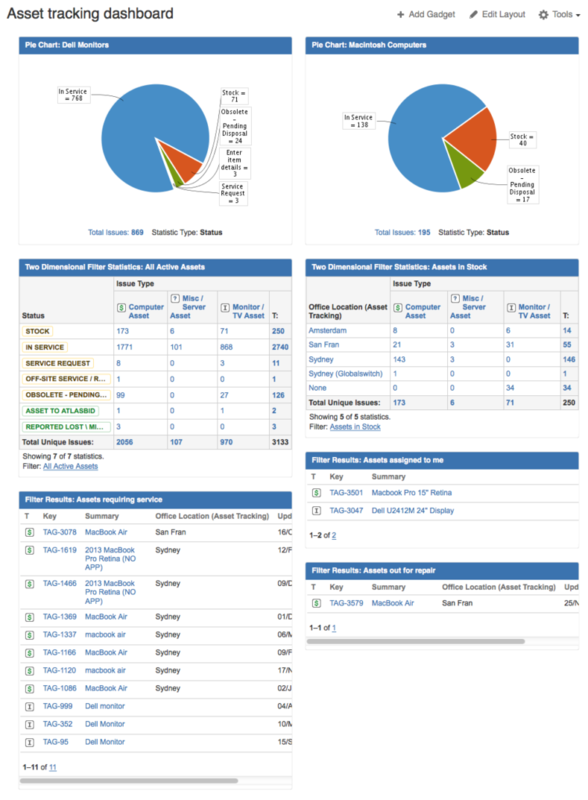 JIRA has excellent visualization capabilities that can create useful reports, especially if you use JIRA Query Language (JQL) to customize a dashboard and provide a clear overview of all of your assets. Pie charts are useful to see the overall health of your asset pool — you can see quickly if too many assets are out for service or lost, or if the pool of unassigned assets is too small or large. Status: How many assets are in each state in your asset workflow? Location: Especially important for distributed offices or borrowed equipment. Service requests: Keep track of all of the assets awaiting service. Assigned to me: A list of the assets assigned to the user who is viewing the report. This is useful when they want to raise a service request on one of their assigned assets. Follow Atlassian's detailed tutorial to set up the asset reports in JIRA. What if my company needs something more complex? As you can see, it is relatively easy to set up a simple asset management system in JIRA. But what if you want to track your physical assets, as well as your employees, customers, software builds and releases, and sales or marketing campaign material? These are all company assets, which make it very complicated to design an effective and efficient home-grown JIRA solution. Riada built their Insight JIRA add-on to meet more complex asset tracking needs, and provides large companies with an expert-level enterprise asset management system. Insight has extensive documentation explaining what it was designed for, and where it can be integrated. Music schools which loan expensive instruments and sheet music. Sporting organizations which need to track equipment and losses. Laboratories which need to track equipment and breakages. Schools - textbooks, music and sporting equipment, science and art supplies, IT equipment (tablets), and more. If you are not sure you could save money by implementing an asset management system, or you don't know whether such a system in your company should be simple or complex, we can help. We can answer all your questions about Atlassian’s JIRA Service Desk and asset management. Or perhaps, you would like to test JIRA Service Desk as a cloud or server version, or license it immediately? //SEIBERT/MEDIA is one of the biggest Atlassian Experts in the world, and we'd love to support you in all aspects concerning the implementation and productive use of JIRA Service Desk and an asset management solution: advice, licensing, integration, and support. Please contact us!